Hullbridge Sports knocked Stansted off top spot with a midweek win over Saffron Walden Town; on Saturday the two teams clashed at Hargrave Park, with clash being the right word as neither team allowed the other an inch, with the tough tackling resulting in six yellow cards plus two reds. Stansted won a free kick inside the opening minute with Dan Okah’s challenge resulting in him getting the first yellow card of the game. He was joined by Nathan Scarborough, Yemi Adelani and Tim Monsheju, with Joe Clarke and Rob Norris going into the book for Stansted. That opening tackle was an early indication of what the fare was going to be in this vital ESL game. Billy Coyne could only fire his free kick into the Hullbridge wall and so that early chance came to nothing. Hullbridge managed to create their first chance in the 9th minute with Adelani having a shot knocked away for a corner. Charlie Turner was able to punch the corner away, injuring himself in the process, but play went on and Emmanuel Okunja has a shot deflected away for another Hullbridge corner. It was Okunja that forced Turner to dive low to tip away another shot in the 16th minute. 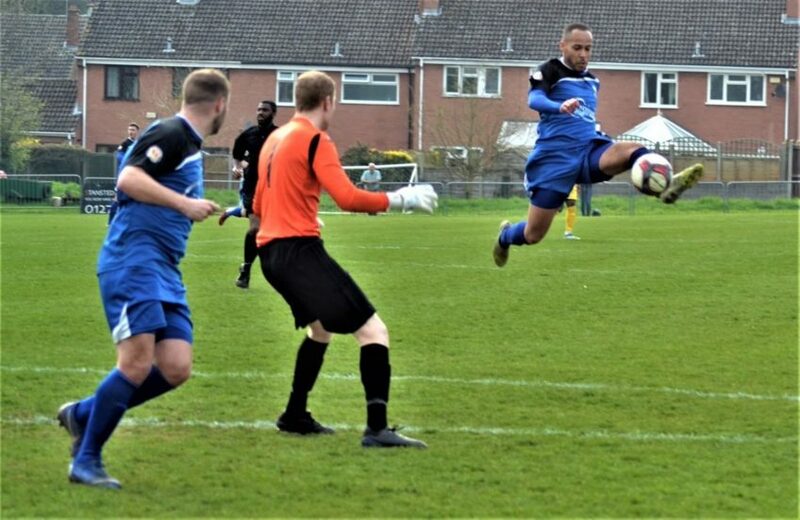 Jamal Allen headed clear a Stansted cross inside his own six-yard box; then Greg Fredericks burst into Stansted’s box but was halted by a solid Joe Clarke challenge. If there was little goal mouth action it was due to the solid, no nonsense tackles that were going on all over the pitch. However Hullbridge had the best chance of the game thus far in the 32nd minute as Scarborough had a volley blocked by the Stansted defence. It had been niggly at times and then in the 43rd minute there was an infringement involving Lewis Greene and Callum Ibe, which saw the Hullbridge ‘keeper come out of his box and then handle the ball. The referee had no hesitation in pulling out a red card and so Goerge Marsh came of the subs bench to replace Lewis. His first piece of action was to face a Stansted free kick but Peagram could only fire his shot into the Hullbridge wall. Despite being down to ten men it was to be Hullbridge that had the first chance of the second half; Frederick headed a ball towards Adelani but Turner did enough to put the Hullbridge player off and the ball floated across Stansted’s goal without any further concerns. Jack Mitchell had a shot for Stansted soon afterwards but Courtney Homans blocked that one, but just as in the first half, neither team allowed the other to get a foothold and in essence cancelled each other out. Things were levelled up player wise in the 63rd minute when Pappa Assamoah first put in a hefty challenge, then got involved in a melee, which resulted in him being shown the red card by the referee. In the 68th minute another heavy Stansted challenge saw Norris get shown a yellow with Joe Skeels blazing his free kick wide, with a subsequent free kick by Skeels being headed clear by Paul Clayton. In a game of few chances meant that it was going to perhaps take something of the spectacular to break the deadlock. In the 72nd minute Peagram nearly provided it, latching onto Clayton’s cross and having a volley that Marsh acrobatically tipped over the bar. That sparked the hosts into life as Clayton had a header saved by Marsh, then Ibe had a shot deflected away for a corner. But Hullbridge having dug in then had a brace of chances in the last five minutes as Joe Wright had one shot blocked by the Stansted defence, while another one was poked over. Defences really had stood the test but in the final minute a threaded ball towards Peagram looked threatening, but Marsh read the situation well and smoothered the ball before Peagram could get a shot off. The goalless draw means that Hullbridge Sports remain top of the table, two points ahead of Stansted. Had they won here then they would have opened up a five point lead. Stansted, who would have gone top had they won, will no doubt be happier with the draw, but for now the ESL title remains very much in the balance. Stansted: Charlie Turner, Pappa Assamoah, Billy Coyne (Capt), Sam West, Joe Clarke (Carl Mullings 88’), Paul Clayton (Ollie Bell 71’), Callum Ibe, Rob Norris, James Peagram, Charlie Barlow (James Turvey 80’), Jack Mitchell. Hullbridge Sports: Lewis Greene, Matt Rose (Capt), Jamal Allen, Dan Okah, Courtney Homans, Joe Skeels, Tim Monsheju (George Marsh 43’), Yemi Adelani (Joe Wright 80’), Nathan Scarborough, Greg Frederick (Adebola Sotoyinbo 77’), Emmanuel Okunja.